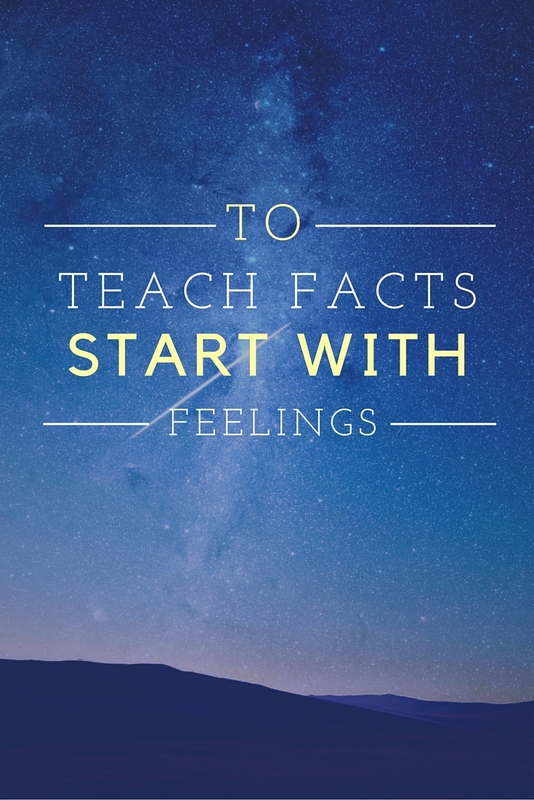 It’s a well-known fact among cognitive psychologists that the brain remembers information best when it’s accompanied by emotion. In fact, the amygdala, the brain’s emotional center, is considered part of the same brain system as the hippocampus, which manages learning and memory. Studies have shown that the amygdala can even modulate the encoding and the storage of memories in the hippocampus. It would be a no-brainer, then (no pun intended), to use this connection to our advantage in educational settings. In fact, far more neural fibers project from our brain’s emotional center into the logical/rational centers than the reverse, so “emotion is often a more powerful determinant of our behaviour than our brain’s logical/rational processes,” writes Robert Sylwester, Professor of Education at the University of Oregon. Because of all these connections leading to and from the emotional center of the brain, it’s only natural for humans to associate emotions with other information–events, objects, sounds, smells, etc. Event facts. “The emotional brain…has the power to open or close access to learning, memory, and the ability to make novel connections,” says Priscilla Vail, M.A.T. For example, while chronic stress can eventually destroy neurons associated with learning and memory, a pleasant learning environment can produce internal chemical responses in students that make them more apt to learn how to successfully solve problems in potentially stressful situations. But how can this information help us reach students in an everyday academic context? While learning Koine Greek in college, Nagel would speak a new word to himself while drawing on one of his senses. Studying the Greek word for “tree,” he’d look at a tree outside the window rather than at its English equivalent in the vocabulary list. Studying the Greek word for “death,” he’d say the word or a sentence using it while conjuring up images in his mind of death and suffering. “By doing this, I attached meaning and feeling to the words rather than attaching other words to it.” Whenever he hears the Arabic word for “orange,” he always remembers the smell of a particular marketplace in Egypt where he learned the word. To learn Irish, he counted repetitions at the gym and used the clock on the wall to time his cardio–in Irish. Further evidence for the emotion-memory connection comes from studies of stress and anxiety. In 2008, researchers at the University of California, Irvine found that negative emotion in the form of stress can actually impede learning and memory. In their study, Dr. Tallie Z. Baram and her colleagues identified a novel process by which stress caused these effects. They found that rather than involving the widely known stress hormone cortisol, which circulates throughout the body, acute stress activated selective molecules called corticotropin releasing hormones, which disrupted the process by which the brain collects and stores memories. Learning and memory take place at synapses, which are junctions through which brain cells communicate. These synapses reside on specialised branchlike protrusions on neurons called dendritic spines. In rat and mouse studies, Baram’s group saw that the release of CRH in the hippocampus, the brain’s primary learning and memory center, led to the rapid disintegration of these dendritic spines, which in turn limited the ability of synapses to collect and store memories. The researchers discovered that blocking the CRH molecules’ interaction with their receptor molecules eliminated stress damage to dendritic spines in the hippocampal cells involved with learning and memory. In addition, the authors replicated the effects of stress on dendritic spines by administering low levels of synthetic CRH, and watching how the spines retracted over minutes. “Fortunately, once we removed the CRH, the spines seemed to grow back,” Baram said. So how does associative learning work, exactly? Let’s take a look at a famous psychological study to help illustrate the process. The most basic type of associative learning is called classical conditioning. During his research on the physiology of digestion in dogs, Ivan Pavlov developed a procedure that enabled him to study the digestive processes of animals over long periods of time. He redirected the animal’s digestive fluids outside the body, where they could be measured. Pavlov noticed that the dogs in the experiment began to salivate in the presence of the technician who normally fed them, rather than simply salivating in the presence of food. Pavlov called the dogs’ anticipatory salivation “psychic secretion.” From his observations he predicted that a stimulus could become associated with food and cause salivation on its own, if a particular stimulus in the dog’s surroundings was present when the dog was given food. He replaced the technician with the sound of a bell ringing, to signify the delivery of food. The dogs then began to associate the sound, instead of the technician, with food, and salivated when they heard it. Classical conditioning continues to be studied in attempts to understand the neural structures and functions that underlie learning and memory. Now, as illustrated by LeDoux’s statement, it’s being used to discover the relations between memory and emotion. And some of the results indicate that emotion can enhance memory even more than we previously thought. Researchers at NYU have discovered the neural mechanism that causes us to remember peripheral information in the presence of an emotional event (the “tag-and-capture model”). In a write-up for Nature, they write: “Here we show, in humans, that information is selectively consolidated if conceptually related information, putatively represented in a common neural substrate, is made salient through an emotional learning experience.” In other words, feelings can help us remember more than we are consciously trying to remember. Good news for those of us who like to lecture! Some of the strongest evidence for associative learning comes from studies of the five senses, especially scent. A particularly fascinating study was conducted in the United States and Britain in the late 1970s. The goal was to measure subjects’ emotional reactions to the odorant methyl salicylate (wintergreen). In the British study, wintergreen was given one of the lowest pleasantness ratings, whereas in the U.S. study it was given the highest. The reason for this difference was explained by the researchers as follows: “In Britain, the smell of wintergreen is associated with medicine and particularly for the participants in the 1966 study with analgesics that were popular during World War II, a time that these individuals would not remember fondly. Conversely, in the US, the smell of wintergreen is exclusively a candy mint smell and one that only has positive connotations.” Simply put, our olfactory system is especially primed to learn the significance of odors. In fact, the amygdala synapses directly with the olfactory nerve. And that’s not all the amygdala connects to. Extensive lesion studies suggest that the amygdala is crucial in various kinds of motivated and emotional behaviour related to learning and memory. A study conducted by the Toyama Medical and Pharmaceutical University of Japan revealed that amygdala lesions, both before and after training of conditioned associative learning, impaired emotional expression. The results clearly pointed to the amygdala’s involvement in acquiring and storing associative memory, by which animals recognise and evaluate the biological significance of a stimulus. This information is then transferred to the brainstem’s executing system. The responses of rat amygdala neurons changed plastically during learning. What’s more, more sensory-responsive neurons were encountered in the amygdala of rats trained to associate the sensory stimuli with a reinforcement than in the amygdala of rats that were not trained. The results suggest that the emotional center of the brain performs critical functions in acquiring and storing long-term associative memory. Now that we understand the mechanisms behind associative learning, let’s take a look at how we can leverage it in an educational setting. I’ve always been a big believer in the educational potential of historical fiction. Students tend to resist traditional textbooks, and for good reason. Oftentimes they aren’t well written, and don’t tell a story. Stories engage one’s feelings–from sensations of suspense or anticipation to empathy or identification–and provide a narrative arc that helps us organise information. We may not remember names, events, or details on their own, but if we remember how we felt when we read about them, we’ll have an associative cue to rely on. Music conjures emotion as strongly as an evocative scent. Use this to your advantage. Play a high-energy piece of classical music while practicing times tables with your students, or let students choose a song to listen to while studying vocabulary. Without any conscious effort at all, they will associate the material with the way the music makes them feel, thereby enhancing their recall. Encourage physical activity. A student who reads a different section of a textbook on a different part of campus, walking in between locations, will have a unique, place-based memory to associate with each section. Walking has other benefits as well, such as improving creativity. Who says learning is best done while sitting still? Interacting with other people stimulates our emotions, whether we realise it or not. One benefit of group projects and discussions, aside from buidling team-work skills, is enhancing students’ memory of the material. Take a moment and think back on some of your most vivid memories from your own course work. Are you alone or in the company of others? “Memories are contextual,” Sylwester writes. “…Activities that draw out emotions—simulations, role playing, and cooperative projects, for example—may provide important contextual memory prompts that will help students recall the information during closely related events in the real world.” This is why we tend to practise fire drills in an unannounced, emotionally charged setting: in the event of a real fire, students will have to perform in that kind of setting. Thanks for this post, you’ve hit the nail on the head. It’s all about emotion, as far as I’m concerned. Could be funny, disgusting, terrible, amazing, sad, uplifting….anything that’s going to capture a strong emotion. Of course, you have to know your students well, if you are going to tap into their emotions, as we are all so different. Anyway, thanks again, you’ve reinforced what I had in mind, and given me more food for thought. Holla!! Yepp all i know is to start with smile and Feelings.